Move over Fettuccine Alfredo there is a new favorite pasta dish in town. 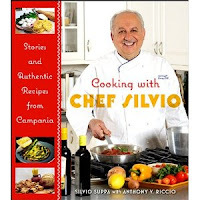 This recipe is from Cooking with Chef Silvio, Stories and Authentic Recipes from Campania. Chris got me an autographed copy for Christmas a year ago. And there is a Madison connection. Chef Silvio operates Cafe Allegra and the Woodwinds in Branford. And his jarred tomato sauces are excellent. Now some of you may know that my grandparents were from Campania. So I love finding authentic recipes. I remember my grandparents on my mom's but I was pretty young when they passed (both of my dad's parents had passed before I was born). So my cooking memories are more from my parent's stories. I do remember my grandmother telling me that eating the fat on a steak was not a good idea. 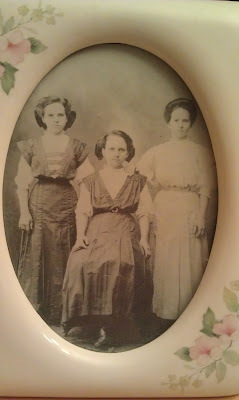 My grandmother (she's the pretty on on the right) with 2 of her sisters. So back to dinner. The flavors were spicy and salty. And I almost made Fettuccine Alfredo but luckily found this recipe. And it only took 20 minutes! In a large frying pan heat the oil, add the garlic and cook until golden. Add the peppers and, stirring frequently, cook until slightly softened, approximately 5 minutes. Add tomatoes, basil, olives, capers, oregano, and salt and pepper to taste. Reduce heat to medium and cook for 10 to 15 minutes, or until the peppers and tomatoes are soft but still retain their shape. Give it a final taste for salt and pepper. Remove from the heat and set aside. In a pot with salted water, cook spaghetti according to the directions on the package. Drain, reserving some cooking water. Add the sauce to the pasta along with half of the grated cheese and toss well. If too dry, adjust using pasta water to moisten. Serve in pasta bowls, sprinkled with the rest of the cheese and garnished with fresh basil or parsley if you wish. And I can submit this post on Cookbook Sundays! I love this kind of dish, and I think this is a great alternative to Fettucine Alfredo.